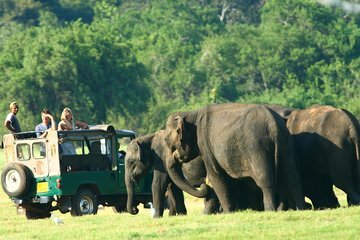 Get a thrilling look at the elephants of Minneriya National Park during this 3-hour private Jeep safari. Travel to a wilderness refuge known for hosting one of the largest gatherings of Asian elephants on earth (each June through September), observing these giant creatures as they drink, feed, and congregate. The chance to observe numerous species of birds, amphibians, and fish is an added bonus.